The Manuherikia Group is a fluvial-lacustrine sedimentary fill in the Central Otago region of New Zealand, at the site of the prehistoric Lake Manuherikia. The area consists of a valley and ridge topography, with a series of schist-greywacke mountains at roughly ninety degrees to each other. The Manuherika Group occurs in the current basins, and occasionally on the mountains themselves. One of the earliest geologists to work in the area, McKay, understood that the Manuherikia Group was probably originally continuous. Although some workers came to believe the sediments were deposited in a series of small, interconnected basins between the mountain ranges, e.g. Park, later workers, like Cotton argued that the sediments had been isolated by later mountain growth. Douglas placed the Manuherikia Group sediments into a coherent genetic context. He drew attention to Manuherikia Group sediments on the top of mountain ranges, and to the observation that sequences in distinct basins were similar. His conclusion was that the Manuherikia Group is the result of sedimentation in a single (except for the earliest stages) very large basin that was later intruded by the growth of the mountain ranges. This basin ultimately grew into a single huge lake – Lake Manuherikia – that extended over some 5600 km2. Palynological work by Couper, Mildenhall, Mildenhall and Pocknall has indicated that the Manuherikia Group is basically Miocene in age. The plant macrofossils, common in the lower Manuherikia Group, are mostly Early Miocene, perhaps with some in the earliest Middle Miocene. Following Douglas, the primary subdivision of the Manuherikia Group is into a lower, fluvial (commonly with coal) Dunstan Formation and an upper, lacustrine Bannockburn Formation. The oldest unit of the Manuherikia Group is the Saint Bathans Member of the Dunstan Formation, consisting of the braided-river fill of valleys incised into the basement rocks. Traces of three St Bathans paleovalleys are known – one at Blue Lake, adjacent to St Bathans, is the best exposed. The St Bathans paleovalleys eventually filled, sedimentation spread out over a broader area, and the fluvial character became dominantly meandering. This material is grouped as the Fiddlers Member. Extensive coal swamps developed between the rivers and their flood basins. Individual flood basin lakes began to coalesce into a true lacustrine system – Lake Manuherikia. Its muddy and sandy sediments are grouped as the Bannockburn Formation. Around the lake margins, distinctive shoreline facies developed. The most widespread of these is the Kawarau Member which contains diverse plant fossils. Distinctive facies within the Kawarau Member have been termed the Cromwell Submember and the Ewing Submember. The Ewing is typically intercalated with the Lauder Member, an informal unit of the Bannockburn Formation. This contains a fossil fauna (the Saint Bathans Fauna) of birds, fish, and a crocodilian, New Zealand’s first known terrestrial mammal, as well as bats. Stromatolites are also present. At two locations around the depocenter, river deltas developed and large thicknesses of coal built up on upper delta plains. These are termed the Blackstone Delta and Teviot Delta. Fully lacustrine conditions ensued with the submergence of these deltas and for much of the mid Miocene, Lake Manuherikia was without known bounds. Rising mountains in the Late Miocene-Pliocene eventually deluged Lake Manuherikia with gravel – the Maori Bottom, or Maniototo Conglomerate. ^ McKay, A. 1897: "Report on the Older Auriferous Drifts of Central Otago." 2nd Ed. N.Z. Govt. Printer. ^ Park, J. 1906: The Geology of the Area covered by the Alexandra Sheet. N.Z. Geol. Surv. Bull. n.s. 2. ^ Cotton, C. A. 1919: Problems presented by the Notocene beds of Central Otago. New Zealand Journal of Science and Technology 2: 69-72. ^ Douglas, B. J. 1986: Lignite resources of Central Otago. New Zealand Energy Research and Development Committee Publication P104: 367. ^ Couper, R. A. 1953: Upper Mesozoic and Cainozoic spores and pollen grains from New Zealand. New Zealand Geological Survey Palaeontological Bulletin n.s. 22: 77. ^ Couper, R. A. 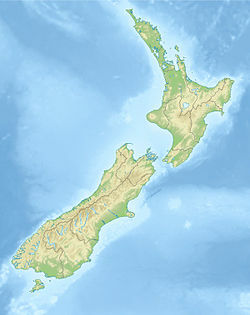 1960: New Zealand Mesozoic and Cainozoic plant microfossils. New Zealand Geological Survey Paleontological Bulletin 32: 88 pp. ^ Mildenhall, D. C. 1989: Summary of the age and paleoecology of the Miocene Manuherikia Group, Central Otago, New Zealand. Journal of the Royal Society of New Zealand 19: 19-29. ^ Mildenhall, D. C. & Pocknall, D. T. 1989: Miocene-Pleistocene spores and pollen from Central Otago, South Island, New Zealand. New Zealand Geological Survey Palaeontological Bulletin 59: 1-128. ^ Molnar, R. E. & Pole, M. S. 1997: A Miocene crocodilian from New Zealand. Alcheringa 21: 65-70. ^ Youngson, J. H., Craw, D., Landis, C. A. & Schmitt, K. R. 1998: Redefinition and interpretation of late Miocene-Pleistocene terrestrial stratigraphy, Central Otago, New Zealand. New Zealand Journal of Geology and Geophysics 41: 51-68. ^ Pole, M.S., 1992. Early Miocene flora of the Manuherikia Group, New Zealand. 2. Conifer. Journal of the Royal Society of New Zealand 22, 287-302. ^ Pole, M.S., 1993. Early Miocene flora of the Manuherikia Group, New Zealand. 6. Lauraceae. Journal of the Royal Society of New Zealand 23, 303-312. ^ Pole, M.S., 1993. Early Miocene flora of the Manuherikia Group, New Zealand. 8. Nothofagus. Journal of the Royal Society of New Zealand 23, 329-344. ^ Hill, R.S., Pole, M.S., 1994. Two new species of Pterostoma R.S. Hill from Cenozoic sediments in Australasia. Review of Palaeobotany and Palynology 80, 123-130. ^ Pole, M.S., 1997. Miocene conifers from the Manuherikia Group, New Zealand. Journal of the Royal Society of New Zealand 27, 355-370. ^ Pole, M., 2007. Lauraceae Macrofossils and Dispersed Cuticle from the Miocene of Southern New Zealand. Palaeontologia Electronica 10 1: 3A, 1-38. ^ Pole, M., 2007. Monocot Macrofossils from the Miocene of Southern New Zealand. Palaeontologia Electronica 10, Issue 3; 15A:21p. ^ Pole, M., Dawson, J., Denton, T., 2008. Fossil Myrtaceae from the Early Miocene of southern New Zealand. Australian Journal of Botany 56, 67-81. ^ Pole, M., 2008. Dispersed leaf cuticle from the Early Miocene of southern New Zealand. Palaeontologia Electronica 11 (3) 15A:, 1-117. ^ Pole, M., 2008. The record of Araucariaceae macrofossils in New Zealand. Alcheringa 32, 405–426. ^ Pole, M., 2010. Was New Zealand a primary source for the New Caledonian flora? Alcheringa 34, 61-74. This page was last edited on 14 April 2019, at 02:30 (UTC).